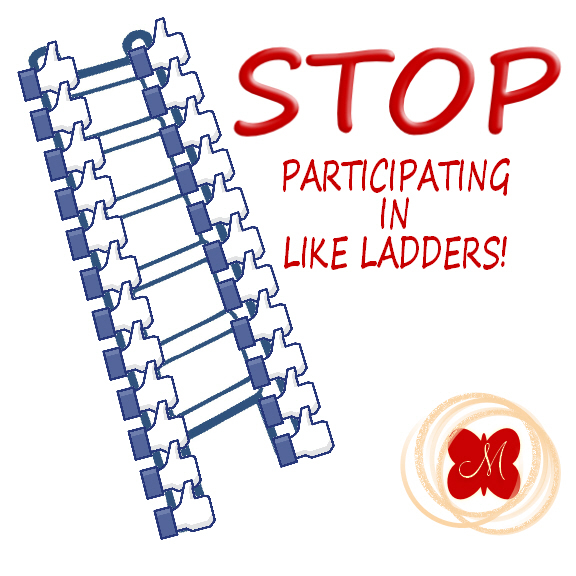 Like Ladders and Exchanges Make You LESS Visible on Facebook! This topic has been coming up a lot with my clients lately, so I thought I would create a reference post with my advice on how Like Ladders/Exchanges could be hurting your reach on Facebook. 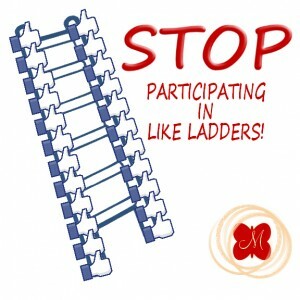 First, let me clarify what a Like Ladder or Like Exchange is. It is a very common practice among small business networks on Facebook. The basic principle is to post your Page in a comment thread and ask for Likes. In exchange you agree to Like all the other Pages on that same thread. These definitely work for getting your number of Likes up, but most of the time (and by most I mean almost all) you are actually hurting your reach by gaining these Likes and hurting the reach of the Pages you’ve Liked UNLESS you only Like a Page you genuinely plan to be engaged with–you want to see their posts because of the value it provides for you and therefore you Like, Comment, and Share most of that Page’s content on a regular basis. In other words, if you don’t really want to see posts about available real estate in New Jersey (because you live in Texas and have no plans of relocating) then don’t Like a Page about New Jersey Real Estate (we’ll call this “Page A”) just because you and that Page Owner mutually agreed to exchange Likes. Now if you offer online marketing tips for realtors on your Page (Page B), then the owner of Page A may want to like your Page and probably should so long as he/she finds your content relevant. But the owner of Page A should not want to request a Like back from you, the owner of Page B, because it will actually lower his/her engagement ranking and visibility to the Fans of his/her Page who are actually looking for property in New Jersey. Stick with me and I will explain what I mean by this. Sally logs into Facebook in the morning and at the top of her News Feed is a post about Julie’s (her sister) wedding proposal. It has 84 Likes and 43 comments (Julie has about 300 friends and about 60 of those are mutual to Sally). This post was made 13 hours ago, but Sally hasn’t logged in to Facebook since yesterday afternoon. The next post after that on her News Feed is a status update made about 1 minute ago from an old high school friend, Tanya, who she doesn’t see very often but she recently received a private message from her on Facebook and they exchanged a few back and forth messages. They are also both going to the same upcoming event, their high school reunion, and were recently both tagged in a post about the event by a mutual friend. The first post Sally sees about her sister is being shown to her because they are sisters and it had a lot of engagement (likes, comments, shares). It was also probably posted as a Life Event on her sister’s profile (Facebook gives a little extra weight to these). The second post was shown to her because it was recent, but more importantly, it is from someone she recently had a lot of interaction with on Facebook (they exchanges private messages, are both guests of an upcoming fb event, and were both tagged in recent post). If it weren’t for the factors mentioned above, Sally may have never seen either of those posts, even though she is Friends with both of them, and even more so if her News Feed is set to “Top Stories” only. Furthermore, if Sally and Tanya continue to interact on Facebook over the next few days, they will see more of each others posts in their News Feeds even if they have been Friends on Facebook for a long time and never saw each other’s posts in their News Feeds before. So if you happen to get a Like or Comment from someone on a post you made a couple of weeks ago, it doesn’t necessarily mean they are stalking you (I mean that jokingly). It could just be that you two recently had more interaction with each other on Facebook than you have had in a long time. Facebook recognizes that and thinks, “Hey these two seem to have a closer relationship than we thought. Let’s show them more of each other’s posts.” The less you interact and connect with someone on Facebook, the less you will see of their activity in your News Feed (unless it gets a ton of Likes and Comments), and in turn notify Facebook that “this person’s posts are not very newsworthy to me at this time”. The opposite is also true. You can go to someone’s Profile or a Business Page and request to Get Notifications to ensure you see their posts more often, but that still doesn’t mean you will see everything, especially if you have very little or no interaction with those Profiles (people) or Pages (businesses). 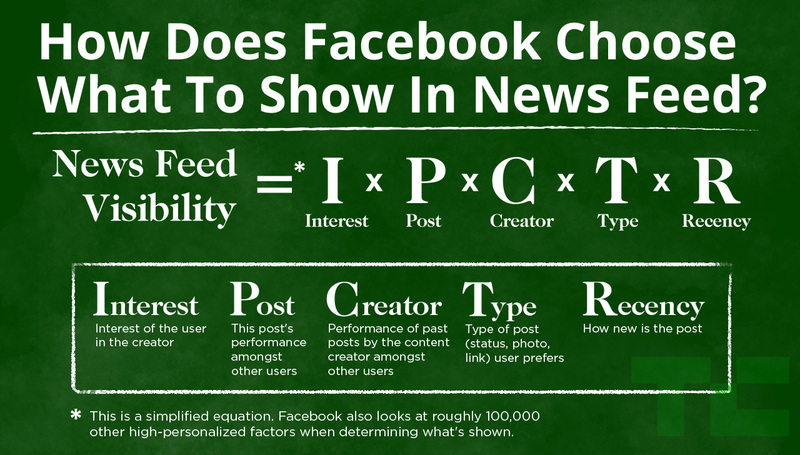 Facebook’s algorithm uses over 100,000 factors for ranking and determining what content you see in your News Feed! On top of that the average Facebook user has over 300 Friends and 15% of users have over 500 Friends. If Facebook showed you everything everyone on your Friends List and the Pages you’ve liked posted AND the ads that Pages are paying to be seen, you could be hit with approximately 15,000 pieces of content at once every time you logged into Facebook. Facebook passes those potential stories through its algorithm (formerly, and still unofficially, known as EdgeRank) and only shows you a small percentage of that, about 2%. Some of those 100,000+ algorithm factors include how many mutual friends like the person, page, or content; how often you interact with a particular person or page; time the post was published; time of the last comment; and the types of content you usually interact with–if your behavior is telling Facebook you prefer videos over links, Facebook will show you more videos. This is nothing new for my clients and followers as I have mentioned this numerous times over the years in my webinars, training classes and coaching sessions, but how does this apply to Business Pages? It follows a similar pattern. The more newsworthy and engaging your content is, the more it will show up in the News Feeds of your Fans, especially to those who are actively engaged and even more so if they requested to Get Notifications from you. A Fan who Likes a lot of your posts, comments often, and shares your content on a regular basis will see a lot more of your Page Posts (possibly all of them if they stay actively engaged) than Fans who are not engaged. Having a large percentage of engaged fans in a way tells Facebook you are kind of a big deal. Your Posts will be more visible to more Fans. A Page with very low engagement from its Fans tells Facebook (and its users) your content is not very newsworthy. People say Engagement Rate is not that important but I beg to differ. If Engagement Rate is an indicator of how engaged my fans are (and it IS), then a Page with a higher rate will be more newsworthy and rank higher in the algorithm, when competing with all the other 15,000+ pieces of content streaming through Facebook at any given time. So how can you tell what your Engagement Rate (ER) is? There are several schools of thought on ER and how to calculate it correctly, and I will reference several in this post, but for the most part it’s simply a ratio of how many Fans are engaged to your total number of Fans. Some will argue a true ER calculation must be made by dividing engaged users by the Page’s total Reach, but we’ll get into that in a bit. I’ll go over 3 of the most popular methods for calculating ER. I’ll start with this one because it is the only metric visibly available to the public. You can go to any Page and find this information. Remember the “People Talking About This” (PTAT) number that you used to see on Fan Pages next to the number of Likes? Well, it’s still available, it just moved to a new place. 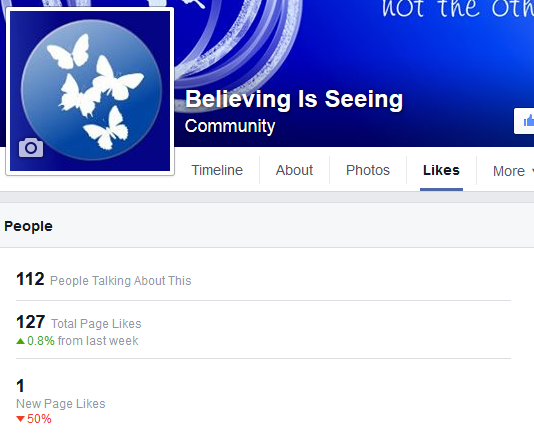 To find the PTAT number, click on Likes just under the Page’s Profile Image (see image below). 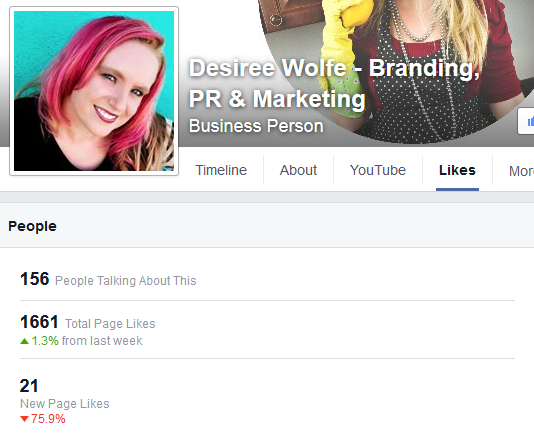 Take the PTAT number and divide by the total numbers of Fans to get your engagement rate. Convert this number to a percentage by multiplying by 100 (0.0425 is a 4% engagement rate, 0.183 is an 18% engagement rate). Keep in mind that this metric is tracking unique users, so if a Fan does more than one of these things in a trailing 7 day period, it only counts as one and only adds one point to the PTAT total. It is counted per user, not per action. This number changes daily, so be sure to keep your fans engaged on a consistent basis to keep your PTAT number up. PTAT is not the best measurement for engagement but it’s a good way to get a quick overview and general picture of your ER at a high level. Here’s an example of how PTAT can be used to gauge interest about an upcoming film before its release date. The reason I say it’s not the best method is because it includes new Likes, which can give a really high number on a day when you get a lot of Fans (perhaps you just participated in one of those Like Exchanges) or you recently launched an ad campaign that got you a bunch of new Likes. If those new Fans do not continue to stay engaged, and you continue to acquire new Fans, your PTAT number may look good on most days even though your engagement really isn’t that high. 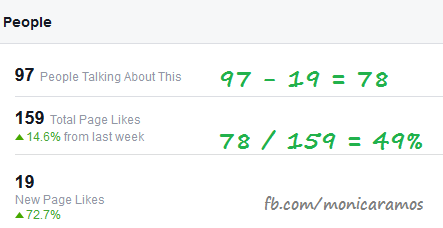 Those new Fans liked your Page but what did they do after that? Do they come back and actually engage once in a while? Regularly? Or perhaps never? If you are going to use this method to track your ER, I suggest subtracting the New Likes from the PTAT number and then dividing by your total number of Fans. A better way to determine your ER is to click on the Insights tab and find your Engagement statistics on the far right under “Engagement”. The number listed as “People Engaged” gives you the number of unique users who have liked, commented, shared or clicked on your posts over the last 7 days. The actual number of Likes, Comments, Shares, and Clicks is then broken out below it. This is what Facebook considers “Engagement”. 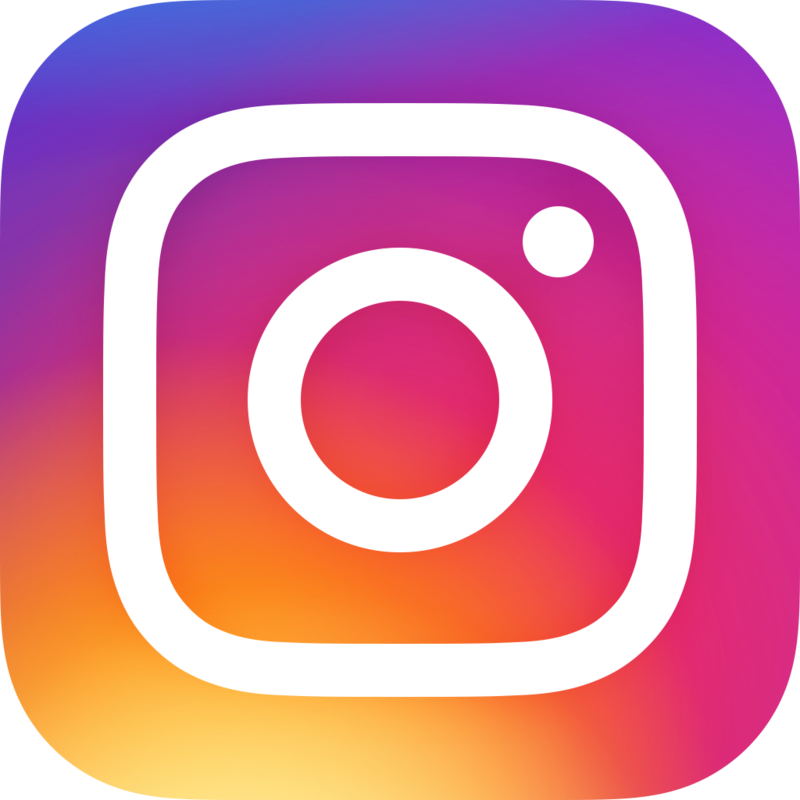 This number does not include Page Likes, but does include other ways users interact with your Page like clicking on your posts, opening a picture on your page, pressing play on your videos, or clicking on a link whether in the News Feed or directly on your Page. Those actions won’t be counted towards PTAT because they don’t create “stories” in the News Feed. Stories show up in the News Feed like this: Sam shared a link or Mary commented on a post. 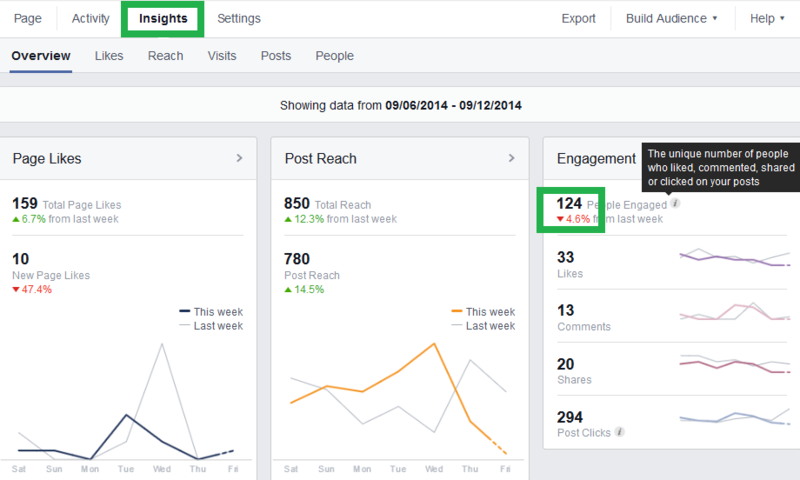 You can get the Engagement Rate of a Post already calculated into a percent for you by clicking on Insights, then Posts, and scrolling down to All Posts Published. Click the dropdown arrow to the right of Post Clicks / Likes, Comments & Share, then select Engagement Rate from the dropdown menu choices. 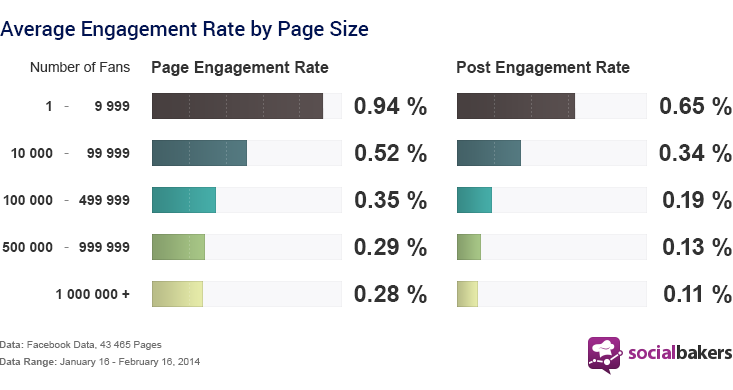 I recommend using the People Engaged number over the PTAT number to measure the performance of your content. This is also what Facebook recommends. If you are often finding your PTAT number is high as a result of gaining new Likes but your overall engagement is low you may want to consider trying some different things to get your fans to engage more. There is a list of my favorite references for increasing engagement at the end of this post. 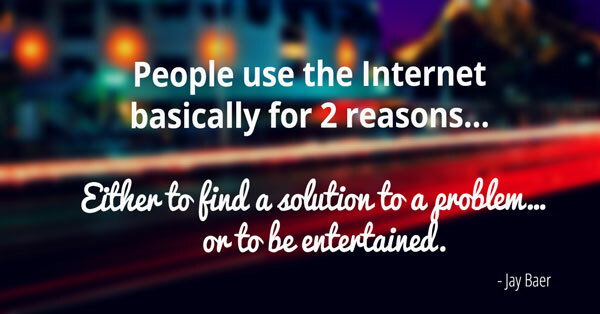 Basically people are looking for two things on the Internet–solutions and entertainment. You’d better be providing both on a regular basis if you want to keep your fans engaged. This method is different than the first two because it does not use total Fans as the denominator in calculating ER, it uses total Reach. Using total Fans assumes that your Fans are the only users seeing and engaging with your content. Last time I checked Facebook Pages were public and anyone can see your content and click on your posts, even if they don’t have a Facebook account. Some would argue that using total Fans as the denominating factor is not accurate because you are producing a ratio of interactions made by both fans and non-fans out of the number of fans. If you want to know how many people are engaging with your content based on the size of your audience, use Reach. When discussing the topic of visibility in the News Feeds of my Fans I prefer to use Method #2 for calculating ER. Reach has it’s place too–perhaps you want to know why so many people are engaging with your content but not becoming Fans? You could some testing with those numbers and use them to improve your marketing strategy. 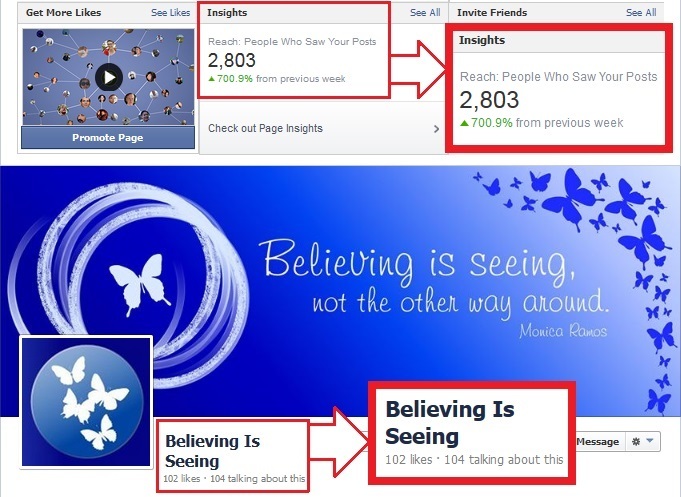 If you are looking increase your fan base, do some analytic work on your Reach stats. I could go on about the different ways to calculate ER but I do not want to get too technical with this blog post. If you are interested in learning more about how ER is calculated, I have provided some links on the subject at the end of this article. Getting your Fans to click on Get Notifications will vastly improve your visibility with those who are truly interested. Many of them don’t even know this option is available. It is your job (or mine if you hire me) to make them aware. Be careful not to over-market on Facebook or they will eventually Stop Notifications, Hide you from their News Feed or Unlike you altogether. When working with my clients I remind them that Facebook is a social network–be social. If you wouldn’t walk up to someone in person and say, “Buy my product!”, then don’t do it on Facebook. Practice good Facebook etiquette. I cover this regularly in my free webinars. If you have not signed up for one of my free webinars yet, you can do so by clicking here, and you will be notified then next time I offer one. At the time of this posting, the next webinar I have coming up is, “The Top 10 Things You Probably Don’t Know About Facebook But Should AND The Top 10 Things You Should Stop Doing on Facebook Immediately!” It’s a long title, I know, but it’s going to have a ton of great info for small business owners, especially those in Direct Sales and Network Marketing. So what is a good rate? Well, that depends on the number of Fans you have. A “good” ER rate on a Page with less than 500 Fans would be considered “excellent” on Page with over 10,000 Fans. And a low rate on a large Page may actually be fairly acceptable on a small Page. Here are some averages and “good” vs “bad” ER numbers from around the web. Keep in mind there is no definite answer on what is a good number, but in general over 10% is excellent on large Pages and 5% is pretty good. For smaller Pages like home-based businesses with less than 500 to 1,000 Fans (the majority of my clients) I tend to recommend an engagement rate of 15% or higher, especially those with under 500 Fans. Mega brands like Coca-Cola and high profile celebrities with Fans in the millions usually have an average ER of less than 1%. If you are seeing engagement over 5% and you are not paying for advertising, you are doing pretty good. However, the larger your fan base grows, the harder it will be to keep up that rate without highly engaged Fans. Many reputable sources, like Social Bakers, report that most Facebook Pages experience an ER below 1%. 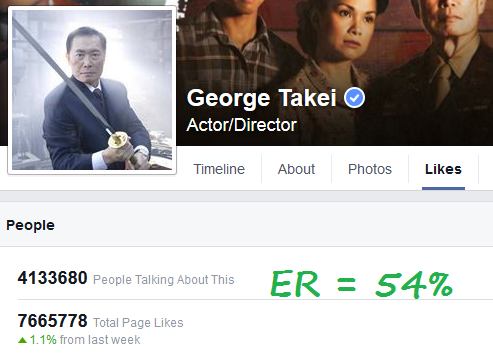 On the other hand, you have people like George Takei, with killer engagement, often times in the 50% – 100% range. George has even been known to have an ER over 100%! 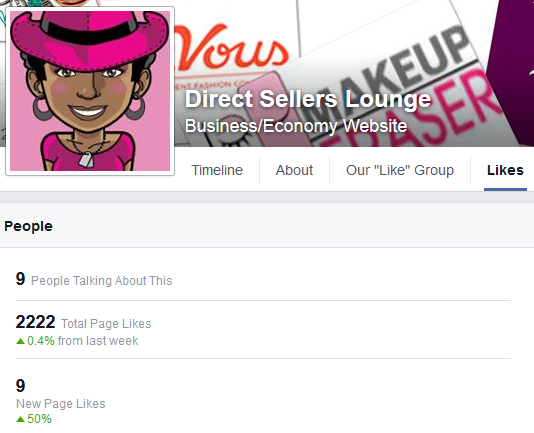 Here’s an example of Page with a good number of Likes for a small business but non-existent engagement. Of the 9 PTAT, all are from new Likes. So don’t worry if you don’t have a lot of fans. Would you rather have 100 people who are in your target market seeing your posts on a regular basis or a fan base of over 10,000 Likes but no one ever seeing your posts unless you pay for ads? When you participate in Like Ladders/Exchanges you are widening the gap between engaged users and total fans/reach and having to work harder or spend more on advertising to reach the people who are genuinely interested in what you have to offer. [Added after this post was published] One of my mentors, Karen Clark of My Business Presence, has even suggested that people go back and UNlike the Pages they no longer are engaged with to help increase their visibility. She’s also asking her unengaged Fans to either click on Get Notifications or Unlike her Page. Karen recommends using the Interest Lists option as an alternative to Liking a Page. And whatever you do DON’T BUY LIKES! Fake likes are even worse than the Likes you get from Ladders and Exchanges. These come with their own host of problems in addition to making you more invisible as I have discussed above. 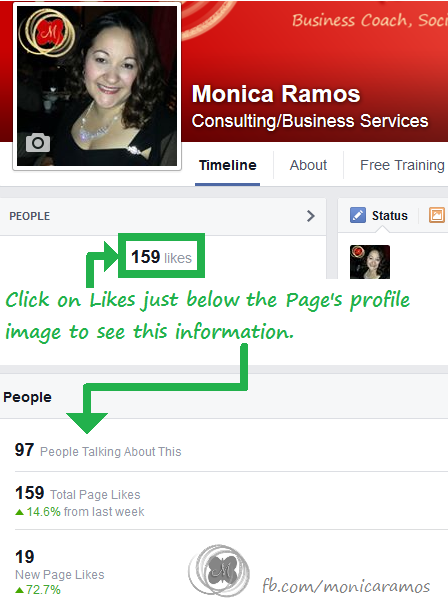 Below are some great links from Social Media Examiner on the dangers of buying fake Likes and how to remove them. If you are having trouble seeing all your Likes, use Method #3 in my post: Why Can’t I See All My Fans? Thank you for taking the time to read this long post. I hope you found it valuable. Don’t hesitate to share any comments or questions below. How Does Facebook Choose What to Show in the News Feeds?